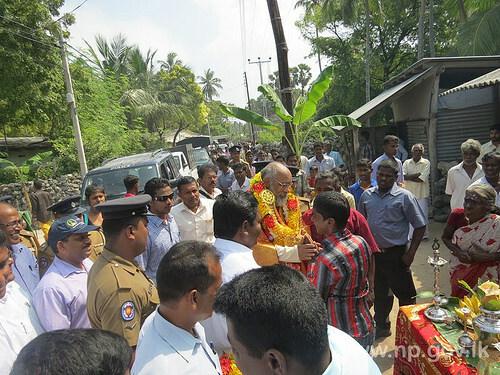 Chief Minister of Northern Province Justice C.V.Wigneswaran made an inspection visit to delft on 26 January 2015 and was accorded a rousing welcome. 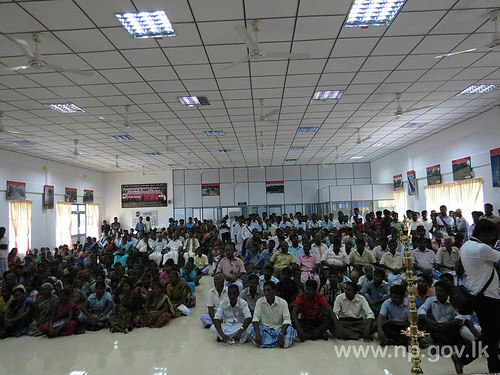 Parliamentarian S.Sritharan, Ponnuthurai Ayngaranesan – Provincial Minister of Agriculture & Agrarian Services, T.Kurukularaja – Provincial Minister of Education, Provincial Council Members, Secretary to the Chief Minister S. Thiruvakaran and other officials were also accompanied with him during this visit. Chief Minister had discussions with the people of that area regarding their needs and problems faced by them and also had discussion with staff of Divisional Secretariat regarding the development works. During this visit, Chief Minister provided dry rations to 250 families and also distributed bicycles and sewing machines to the needy people. Also Rs.400,000 was given by the Chief Minister for general works of the region. Also, he visited to ruined historical places and had discussion with the relevant officials regarding tourism development of Delft region. The Delft Island (known as Neduntheevu in Tamil), located off the northern-most tip of Sri Lanka, will soon be provided with electricity for 100 percent of its population. Earlier, less than 50 percent of the island’s population had access to a continuous supply of electricity, if at all. President Mahinda Rajapaksa, this week, ceremoniously commissioned the Delft East and Delft West electricity supply schemes from the Velanai Electricity Consumer Services Centre in Jaffna, which was also simultaneously declared open by the President. The Deputy General Manager (Northern Province) of the Ceylon Electricity Board (CEB) and Project Director of the Uthuru Wasanthaya (“Northern Spring”) Programme Mr. D. K.P.U. Gunatilleke said three power generators were newly installed in Delft, and that will help meet the electricity needs of 98 percent of the island’s approximately 1,300 households. Previously, less than half of the population in Delft had access to electricity. “The power supply was scattered at that time due to infrastructure constrains,” Mr. Gunatilleke said. “Therefore, the families were not able to receive electricity around the clock. The Delft Island, which has an area of 40 sq km, was severely affected by the conflict. Since travelling to and from the Island required moving across land or sea that was susceptible to heavy fighting, there was hardly any movement of people or goods between Delft and Sri Lanka’s mainland, thus isolating the people of the island for decades. Following the commissioning, President Rajapaksa travelled to Delft, becoming the first head of state to do so. The CEB began supplying uninterrupted electricity to Delft in 2011 with the support of the Sri Lanka Navy. Mr. Gunatilleke assured that “Delft Island will soon enjoy 100 percent electricity supply” with the opening of the new power supply schemes.